Established in 2005 by friends Tony Stone and Bob Arnott, Stoats provides good quality oat products which are nutritionally rich, convenient and help satisfy hunger at all points in the day. Their product range includes porridge sachets, porridge bars, porridge quick pots, flavoured porridge, mueslis, oatcakes as well as 750g boxes of porridge. I’m an oat fan and I eat them just about every day, so I’ve been enjoying trying out a range of their products and the porridge bars and muesli are particular favourites of mine. 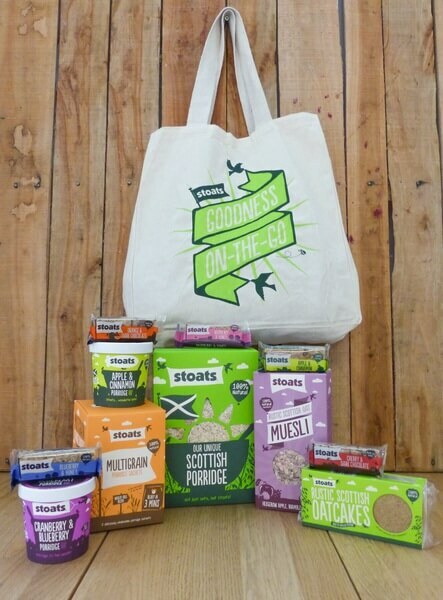 I have a goody bag of Stoats products to give away to one lucky reader. The pack is worth £20 and contains quite a selection of products. In fact, it would be a nice present for someone who loves their morning porridge. Enter via the Rafflecopter widge below. Competition closes on 16th December 2016. The apple and cinnamon sounds delicious and really warming for this time of year! I’d try the apple and cinnamon porridge. I eat porridge pretty much every day so this prize would be great. The apple and cinnamon sounds really delicious! Apple and Cinnamon porridge Quick Pot. As a Delicious combination of flavours. I love berries, so it would be Cranberry & Blueberry for me! The Cranberry & Blueberry flavour – it sounds lovely! I’d try the Cherry & Dark Chocolate Porridge Oat Bar. I’d try cranberry and blueberry, sounds yummers! I would try the Cranberry and Blueberry first. I think I would try the apple and cinnamon first.. yummy! Id try the Raspberry and Honey first! Apple and Cinnamon sounds delicious! Apple and cinnamon. Merry Christmas ???????????? I’d love to try the Apple & Cinnamon first 🙂 Don’t mind in which form – I just adore oats! Ooooh – the cherry and dark chocolate oat bar sounds yummy! The apple and cinnamon sounds good! The Blueberry and Cranberry porridge sounds absolutely delicious. Thanks for the chance. I am a massive Cranberry fan so would love to try the Cranberry and Blueberry porridge! It sounds the perfect way to wake up! The Cranberry & Blueberry sounds yummy to me. Thanks for the lovely giveaway.